Shots Given: Paperwork provided at pick up. APRI#/UKC#: Paperwork provided at pick up. 1. This dog is being sold as a companion pet only, and not for breeding, showing or any other use. At the time of sale, the Purchaser will receive a photocopy of the puppy's lineage certificate and a receipt for the purchase price. This will be the only paperwork to be issued at this time. Purchaser is required to neuter or spay the puppy at or prior to the puppy turning six months of age and proper certification by a licensed Veterinarian must be provided to Carlsbad Cotons within thirty days thereafter. If the Purchaser fails to provide sufficient documentation to prove the puppy has been spayed or neutered within the 30-day grace period, the Purchaser will not be forwarded the registration documentation for the animal. In addition, failure on the Purchaser’s part to provide said documentation within the 30-day grace period constitutes a breach of this contract. The Purchaser agrees to pay the Seller an additional $2,000.00 which is the premium charge for a breeding and or show quality dog. The $2,000 becomes due immediately upon notification of the Purchaser. 2. The Purchaser has 48 hours from the time he or she receives physical custody of the puppy to get the puppy checked by a Veterinarian. If the Purchaser’s Veterinarian determines the puppy has genetic defects that would hinder its role as a companion pet, the animal may be returned immediately for an exchange of another animal of the same breed and comparable quality. No monetary refunds will be made. Seller is not responsible for any airborne viruses or other illnesses contracted after the puppy has been exposed to a new environment (i.e. influenza, parvo, pneumonia, etc. ), and no refund or exchange will be made for a puppy under these circumstances. Carlsbad Cotons is not responsible for Veterinarian expenses or any other expenses incurred by Purchaser with regard to the animal purchased. Carlsbad Cotons guarantees the puppy for a period of one year against any genetic or hereditary problems. 3. Seller does not guarantee color, size, bite, pigmentation, champion parentage, or the temperament of any dog. 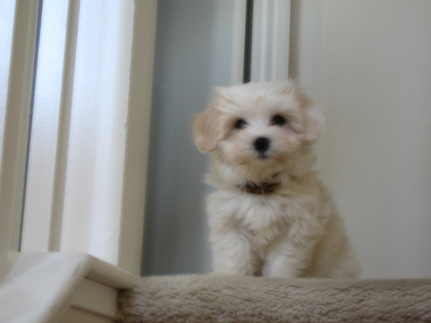 The Coton de Tulear is hypo-allergenic, however some individuals will have an allergic reaction due to transference or saliva. Carlsbad Cotons is providing a hypo-allergenic dog to purchaser and no refunds with regard to allergic reactions will be issued. Purchaser should do his/her due diligence with regard to this matter before purchasing. If for any reason the buying or selling of this animal ends in litigation on any level both parties agree that the venue for same will be Temecula, California. 4. The deposit towards reserving a dog is non-refundable. Purchaser has 10 days from the date he or she is notified by Carlsbad Cotons that the puppy is ready to be picked up, to pay the balance owed for the purchase. Failure on the part of the Purchaser to pay the balance within the 10-day grace period will result in the forfeiture of the deposit at a daily rate of $50. Purchaser agrees that the Seller has the right to resell the puppy after the 10-day period to mitigate damages. All sales are final. 5. Failure to pick up your puppy on it’s go home date (GHD) will result in a $25 per day boarding fee from said date, until picked up.